How do you keep yourself energise so that you could go for a session or two at the gym, a night out with friends, back to back business appointments or a romantic dinner with your loved ones after a hard day at work? Some would chug on lots and lots of energy drinks, some opt on caffeine and some would go for more extreme measures that I dare not trying (clothes peg on eyelids, eat chillies or rub hot cream over the eyelids). Whatever your 'poison' is, at times, one just need that extra energy to keep on going. And yet, at the same times, you have to be cautious of its side-effect to your health and make sure that it is age-appropriate. The crazy bunch after the laser tag game - hyper and active! Coffee and energy drink has always my means of escape from fatigues and whenever I need the extra boost. Now with Taurus Energy Drink, I have more choices to choose from to boost up my energy whenever needed. And I strongly recommend this amazing concoction of energised ingredients to all the fitness enthusiasts, gym freaks and extreme-sports junkies as it will certainly boost up the energy and healthy at the same time. With the current choice of energy drink ie Taurus Energy Drink, I feel more energetic and focused in my daily work and the creative juice keeps on flowing until midnight! It helps with my work too as Taurus Energy Drink provides a quick source of my mental energy. So, there you go people, that is my current secret on how to keep on going until midnight. And yes, this is my daily weekday routine - without fail. I guess by now everyone is eager to know what are the 'good things' inside Taurus Energy Drink that make one stay active and focus. And the fact that it is Halal certified (JAKIM/(S)/(22.00)/492/2/ 1 004-06/2014), that alone should kill all those lurking questions in your minds. I particularly love the after taste of Taurus Energy Drink as it has very little sugar and not so sweet. And also that the fact that is has no fat is just the cream on top of my fat-free ice-cream! That is why Taurus Energy Drink could become the right drink to quench the guilty pleasure of some gym freaks! As a workout lover, Taurus Energy Drink gives me that extra energy to go all out during the session. At times, I also love to vary my workout routine by swimming. And here is the video where I swim and pretend that I am a merman that discovers the secret energy of the sea which is Taurus Energy Drink! No shame to have the little fantasy and imagination. I bet all of us imagine the same too whenever we hit the pool! Hehe. Please head on to Taurus' social media links to know more about Taurus Energy Drink. 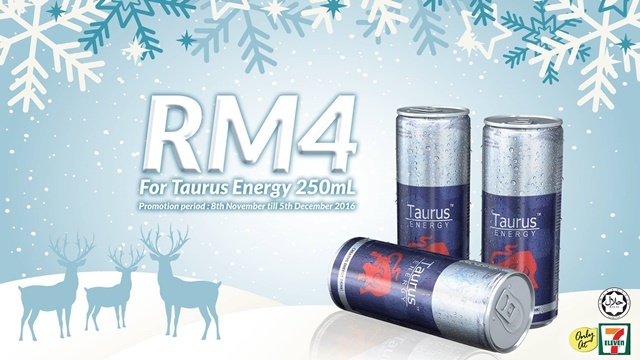 For this festive season, get your cans of Taurus Energy Drink to keep your energy throughout the day. ah, energy boost drink. would try this later since my works schedule getting hectic now! thanks for sharing! Good drinks that give energy. Never tried it before. Wow you really have a packed schedule. No wonder you need energy drink to boost your energy! This is perfect for my busy schedule and I can't find coffee! This looks like a good way to gain some energy - but the question is how long does it stay in your system ? Can you go to sleep easily? I haven't heard of this energy drink before. Will look for it, hopefully is not too sweet like another energy drink. Thanks for sharing. I need this now!